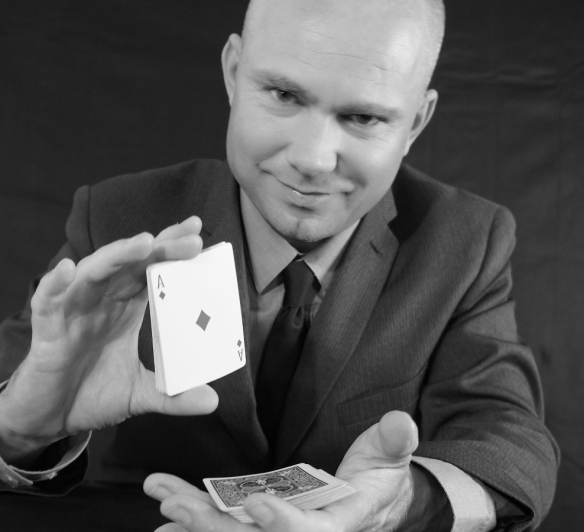 15 years because of his experience and reputation ,performing mindblowing close up magic that is suitable entertainment for all ages and never fails to give your party or event that extra WOW factor that will make your event stand out from the crowd and be remembered for years to come. "Dear Jeremy we just wanted to say a big Thank You for entertaining us and our guests with your magic at our Wedding Reception , it was amazing and really made the evening"
"Thank you so much as it really helped to make the evening a success and people really enjoyed your magic"
Close up Magic is a very popular and unique form of entertainment where the performer mixes and mingles with guests using sleight of hand and misdirection techniques to create the illusion of magic and astonishment and thus great entertainment for your guests, Jeremy has been regulary booked as a Magician in Portsmouth and Southsea over the last 15 years. 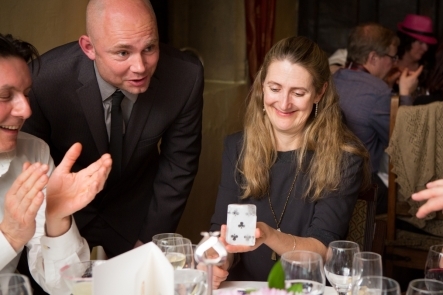 "When you see someone shuffle cards one handed then you know hes probably going to be someone you would not play cards with"
A close up magician works exceptionally well at wedding receptions as it breaks the ice amongst guests and gets the atmosphere off to a good start ensuring your guests are in a perfect upbeat mood which sets the day of to a very good start . 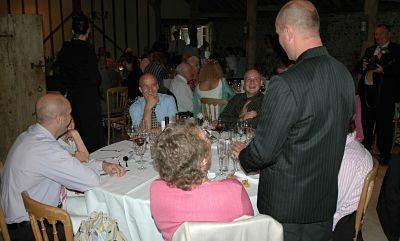 It is perfect at the drinks reception ,your guests can be entertained while magician mixes and mingles . 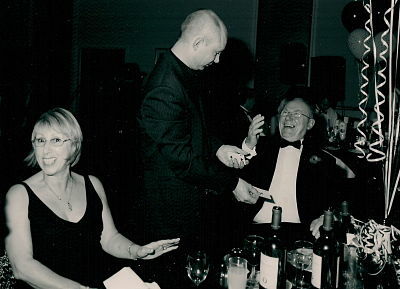 Another perfect time is when the photos are being taken as this usually involves a lot of waiting around and dead time for guests and its the perfect time for magician to keep everyone of all ages entertained going from table to table and keeping the atmosphere upbeat. 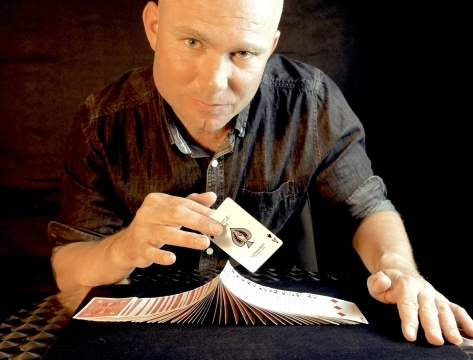 "I still have the card from the trick where our signatures merged onto one card and ill always keep it "
intrigue and entertain audiences of all ages. 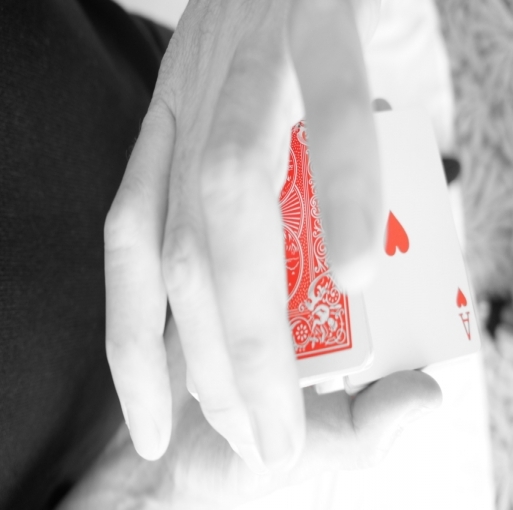 Jeremys style of magic very much suits your casino themed night in Portsmouth and Southsea as he has a style that fits in with the theme of casino cheating and performs elaborate entertaining card tricks that utilise amazing sleight of hand and manipulates poker chips where the poker chips jump from hand to hand that look like trick photography , Jeremy also demonstrates con games like chase the ace or find the lady of which is a popular con game used by hustlers to cheat people on the streets of London Paris,New York and Jeremy may even take someones watch without them knowing and of course give back. 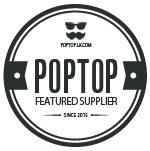 "You were fantastic at our James Bond Themed night and out guests loved the poker chips trick it looked like a camera trick"